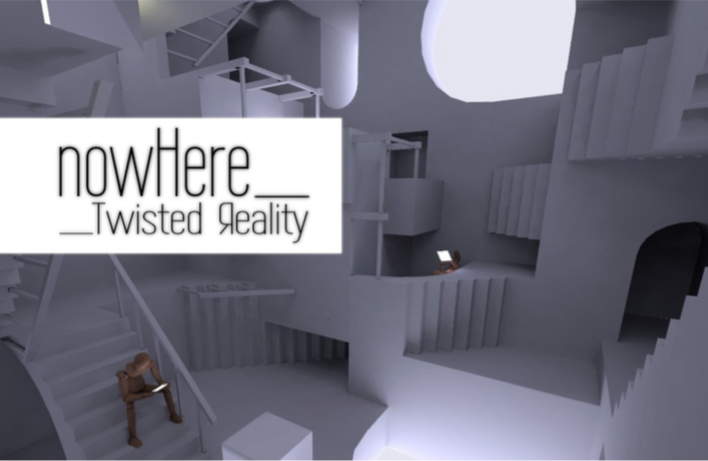 nowHere is an artistic virtual reality experience inspired by M.C. Escher’s lithograph ‘Relativity’ , exploring impossible objects, in nity, hyperbolic geometries and symmetry. The visitor is able to explore the virtual space of a twisted staircase by walking through various portals that lead to different locations inside the same room, having different gravitational orientations. From each of the locations it is possible to view the other portals / locations that one has -eventually- visited previously. Two of the portals connect the room with the outside world from where the entry into the room is realized as a huge cell phone. Initially white, the portals become gradually more transparent when approaching them. A second element that is being addressed by the artwork is the observation of an increasing transfusion and blurring between a man-made environment and nature, also emphasized through distorted, high pitched recordings of mobile device noti cations, resembling the sound of birds, that can be perceived outside of the Escheresque room. The artwork can also be perceived as a rather dystopian view on modern society in which we immerse ourselves deeper and deeper into a complex virtual, de-localised world, seemingly connected but yet physically isolated. The result is a poetic and metaphysical game-like environment, that makes one contemplate about place and being nowHere. The application is written in C++ and runs on Android. It makes use of and improves upon well known marker tracking techniques [2, 3] that enable the accurate self-localization of the virtual reality headset inside a designated area. Thus, a visitor wearing the headset is not only able to look around, but also to walk through the virtual space. For this it is necessary to have a set up a space with a set of prede ned simple marker images that can be detected by the device’s back camera. Detailed instructions will be given in the next section. Although the physical space that is available for movement is limited, the use of portals inside the virtual space makes it possible to always direct the visitor back towards the centre of the room while at the same time giving the impression of a much larger area that can be explored in the virtual world. *nowHere is a collaboration with A. Kettler.